Every year when Summer rolls around we like to entertain a lot of friends and family members here at our home. Several times a month you can find us out in the backyard hosting a barbecue cookout or pool party. Along with all of that entertaining comes along some great tasting cocktails to serve to our guests. The great folks over at Three Olives sent over this cocktail recipe that utilizes pineapple juice. I love pineapples so this cocktail recipe is right up my alley. Besides that, it is tropical and just perfect for the summertime season. Don't ya think? I think so! I have to make it this weekend, it looks totally delicious and cooling for the hot summertime! Mix first two ingredients in a shaker filled with ice & shake vigorously. 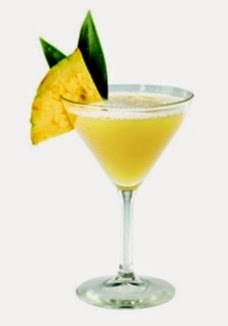 Strain into a chilled martini glass, top with club soda and garnish with a pineapple slice. Disclosure: The photo and recipe is courtesy of Three Olives. You must be 21 years of age or older to consume alcohol. Please drink responsibly and always use a designated driver.